In 1945, when U.S. soldiers began to return to their families from the battle zones of World War II, the United States, from the government to the nuclear family, was forced to face a new reality. What was for everyone a joyous, thrilling occasion became, for far too many families, the beginning of a new and unknown struggle–that of caring for a veteran who has known nothing but war for the past 4 years. Though there had been a number of movies prior to the war’s end that touched upon the possibility of soldiers not coming home at all, no one really dealt with the possibility of a soldier coming home permanently injured, or having lost touch with reality at home. The year after the war’s end, The Best Years of Our Lives, a film dedicated to documenting in brutally honest detail exactly what American families were going through at the time of release, came out and did just that. The story follows three soldiers, Fred (Dana Andrews), Al (Fredric March) and Homer (Harold Russell), who return to their Midwestern hometown of Boone City after the war’s end. Unknown to his family, Homer has lost both hands in the war, and has been given a pair of hooks to approximate the general functions of a hand. As he is dropped off by Fred and Al, his family runs to greet him, showering him with hugs and greetings. Then his girlfriend runs over from next door and does the same…but he does not hug her back. As Fred and Al drive off, Homer lifts up his hand to wave goodbye to them, and his family sees what he has been afraid of showing them. 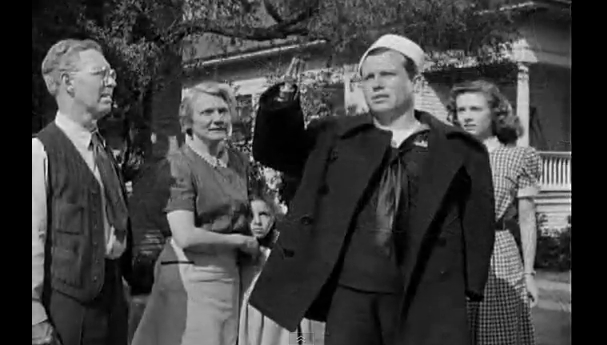 Real life disabled veteran Harold Russell as Homer Parrish in “The Best Years of Our Lives,” in the famous scene where Homer’s family sees for the first time that he has lost his hands. What is magnificent about this scene is that you can literally see the family’s faces transform from joyous happiness to horrified shock, all in less than 2 seconds of screen time. Its involvement of every single character on the screen to create a truly dynamic scene, one that is over in the blink of an eye, is absolutely remarkable, and it is to the great credit of director William Wyler that this scene happened the way it did. It is also at this moment that the film takes a turn, and we know what we are about to see unfold. We see Fred and Al return to their families, and each of them experiences a different kind of homecoming. Al returns home to wife and children who have essentially become strangers. Myrna Loy plays Milly, Al’s wife, with skill and grace, embodying the housewife who has been living life without her husband for 4 years, and experiences a form of culture shock when he returns. 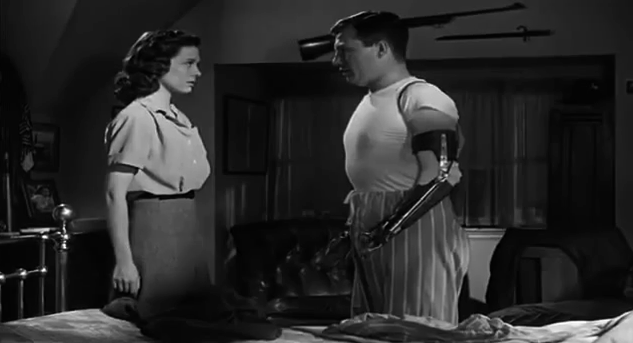 There is a scene in which Milly fixes Al breakfast in bed, trying to reconstruct the life they had before he left. It is intensely awkward, with Milly rarely looking Al in the eye throughout the entire scene, and making seemingly banal conversation. It is an indication that no matter how hard they might try, the structure of their family is permanently altered. Fred returns home to a wife who has taken a job at a burlesque revue, and has also taken to having gentleman callers. She wants to go out every night, while Fred prefers to stay in, much to her dismay and frustration. She wonders if he has been hurt mentally, if not physically, as he has changed since he came home from war. It may be inferred from some of the hints that the movie drops about Fred, that he might have been suffering from depression following the war’s end. He has trouble finding a job, and finally ends up working at his old job, but in a much lower position. The struggle to find and keep work after returning from war is a major theme in the movie. Homer is unable to work due to his disability. Like Fred, Al is offered his old job at a bank, but, unlike Fred, in a higher position. However, he runs into trouble when he gives a loan to a former soldier with no collateral, in an act of camaraderie and empathy for his situation. He is also affected by a drinking habit that embarrasses him and the company when asked to give a speech at a company meeting. Homer, who initially seemed unfazed by his disability, quickly begins to display insecurities when faced with the denial of his family. Homer’s family is absolutely fascinating, because all of their communication about Homer’s disability is exchanged through glances. There is not one word spoken about it. It is only Homer’s girlfriend who will talk openly and honestly about it, and she makes it clear that it makes no difference to her. Before the war, Homer had promised her that when he returned they would marry, and Homer expresses doubt that he’s good enough for her with no hands. The girlfriend reiterates that whatever he needs done, she will do. When Homer demonstrates for her what that means by showing her how he removes his hooks at night and gets ready for bed, the girlfriend gently and lovingly removes the hooks from the bed and sets them aside, lovingly buttoning Homer’s pajamas. It is a very touching scene, and shows the audience what it means to truly dedicate oneself to a newly disabled loved one. The three soldiers remain relatively close, and often meet at Butch’s Bar, a joint that Homer recommended when they were on their way home. It is here that Fred, unsatisfied and frustrated with his life at home, begins to fall for Al’s teenage daughter (played by Teresa Wright). 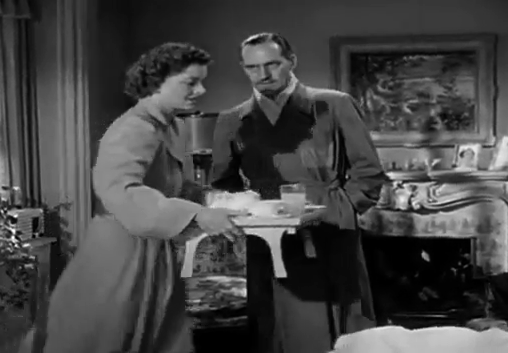 Though in the grand scheme of things, this is a relatively minor plot point in the movie (the main plot points being related to the soldiers’ struggles in reintegrating into society) and occurs toward the end of this 3-hour movie, it is, obviously, significant in reshaping the dynamic both in Al’s and Fred’s family life. Al becomes suspicious of Fred and also of his daughter, while this is the final straw in an already broken marriage between Fred and his wife. Though the relationship is unresolved at the end of the movie, it is inferred that Al’s daughter stays with her high school boyfriend, to Fred’s approval. The movie ends at Homer’s wedding with his girlfriend. All’s well that ends well in this movie that, in the bulk of it, deals with harsh realities, and at the end, offers a projection of hope into the future. It is interesting that, with the slightly possible exception of Fred’s wife, there is no bad character in this movie. Everyone is portrayed in a very real way, with all the flaws that come with coming to terms with a returning veteran, and Wyler is careful not to allow judgment to pass on any character. Every action that might be considered mean or problematic, is qualified by the notion that this is a new situation for all involved. Even a character that Homer encounters at Fred’s soda fountain who chides the United States, in front of Homer, for entering the war at all, is excused by his own ignorance of the situation and what to say to returning veterans. The movie is above all an exploration, not a derision, and the purpose is not to pass judgment on people still coming to terms with the effects of war, but instead present a realistic and honest view of what the country was going through. It is striking just how modern this movie is, and very relevant to what is going on today in the political climate of the United States. I think it would behoove many of us today to revisit this movie, for our own benefit and for the benefit of those who are currently returning from active duty. Its themes are timeless and important, and we can learn a lot not only about the ravages of war on all levels, but about the effects on the family and, ultimately, about ourselves. Excellent write-up. You’ve really captured the essence of the movie. Excellent analysis. It’s one of my favorite movies, as well. Great post. I think it’s one of the greatest movies. I first watched it because I love Myrna Loy so much, but I became attached to every character in the movie; you’re right: there is no “bad” character in the movie. Truly a classic.